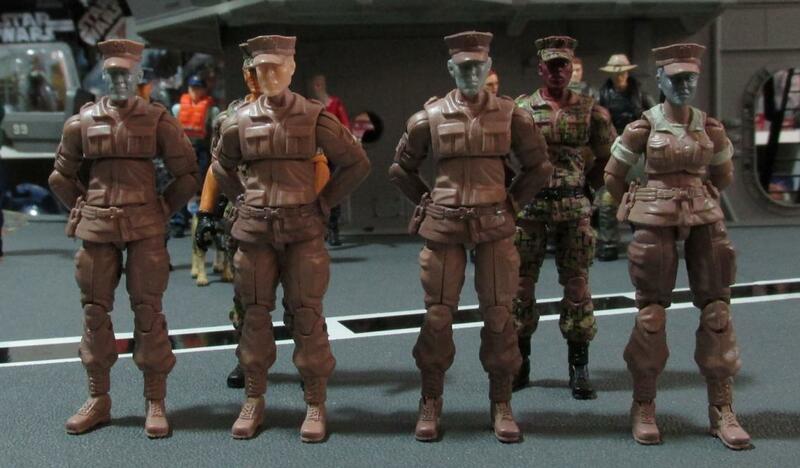 - Finshed casting the remainder 3 Marines for the Marine Guard Detachment. OK, first picture is of the painted dark blue sailors and the latest female cast sailor for this team. At this point, I was running multiple molds this figure was put together from extra parts. She will be painted from head to toe. 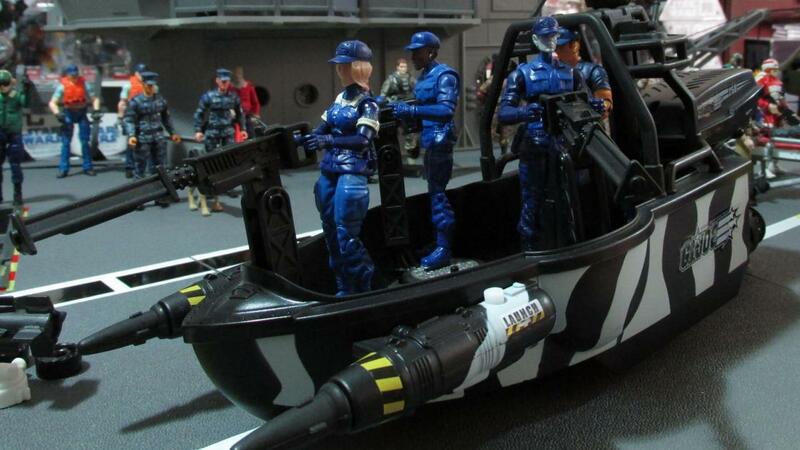 Next picture is my recently quired Piranha Attack Boat with the crew I made for her. 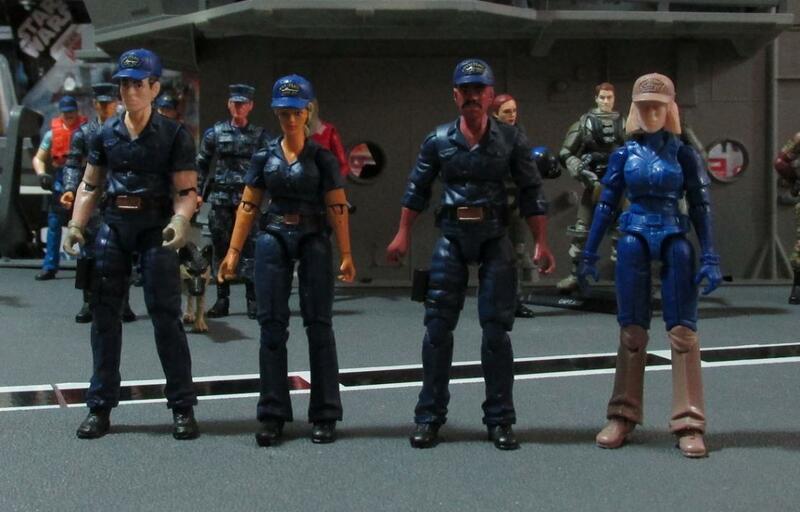 This crew design is based on the uniforms used in the movie "Battleship". I love the sceen in the movie when they send out a patrol boat to investigate the object in the water. The two male gunner use the figure construction of the Marine figure with the substitution of the Marine hat with the USS Flagg hat. The Pilot is one of the dark blue sailors. The female sailor is a modified female sailor arms and torso with the legs of the Marine kit and shirt skirt. All but one of the heads were random casts that I had laying around, the other one is a ROC Heavy Duty head I had extra. I still need to make a mold and cast the Shocktrooper tactical vest for the crew. 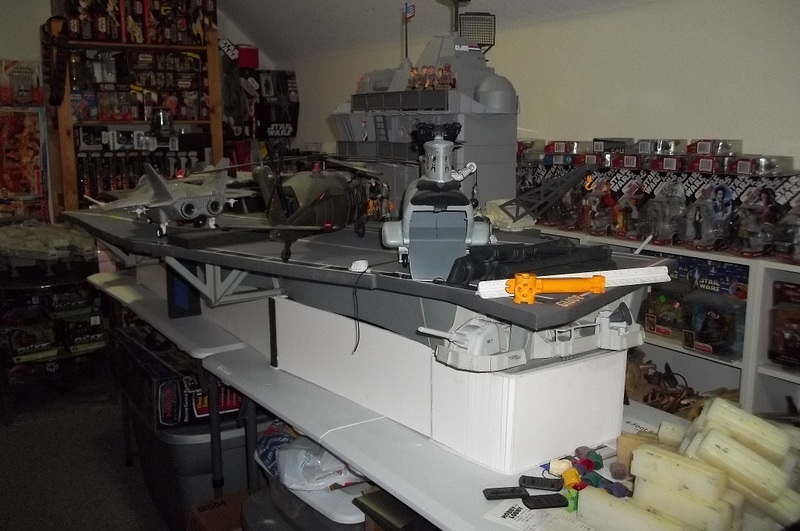 Next picture is another casting of the Weapons Transport vehicle cast in white. I have seen pictures of deck vehicles in both yellow and white. I ordered 2 sets of stickers for these vehicles. I was thinking of casting a couple of the trailers and make some type of generators, heaters, and/or lights. Still researching how to pull that off. 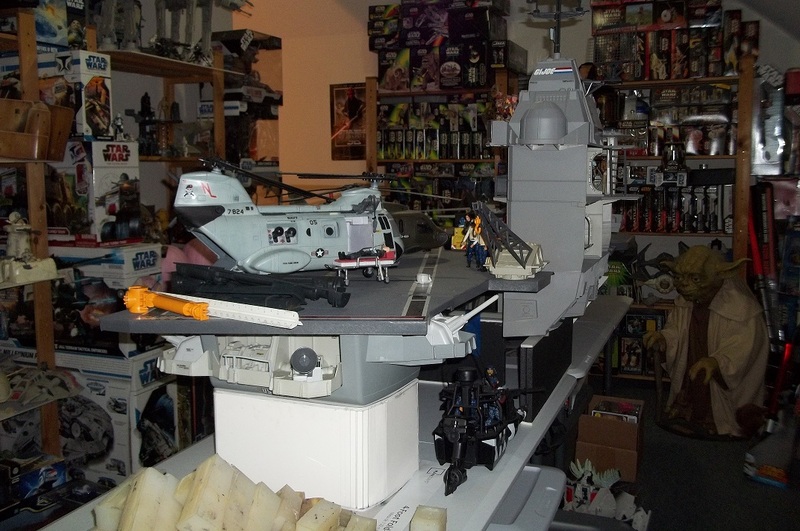 Next picture is the Tonka Sea Knight. I managed to get it primered in order to get rid of the Coast Guard colors and stickers. I picked up some Aircraft Grey paint and started looking at what stickers to put on it. After researching verious designs, I figure I will go with Low Vissability markings. Cobra Stickers has two sets that should work with this: the Conquest X-30 version (for the star and bars stickers) and the Skystriker version numbers (for the numbers, NAVY and USS Flagg stickers) I figure I can use one of the nose cone art sticker like Flint's for the squadron logo. I can't do much with the insides of the toy because they used the triangle head screws. So until I find that type of screwdriver, I will have to be content with just a repaint at this time. Still, it looks cool all painted in grey right now, should have the final coat later this week. Last up is the remainder Marine figure casts. I ran 3 more copies of the Marine male kit to fill the 5 Marine roster for the Marine Guard Detachment. After I did that, I had an idea to make a female Marine using parts from the female sailor arms and torso and the parts from the male Marine legs, shirt skirt and hat. To accomplish this, I needed to trim and mod the collar on the torso to match the male torso design. Then I shaved the arm sleeves and sculpted the rolled up sleeves designed after the Sgt Stone arms. I used Aves fixit epoxy instead of my normal wax sculpting method. I did not want to create another mold and cast these parts just for this figure as well as the tactical female sailor. The head was also a mod of a previous head sculpt of mine that I added a braid tail to the back of the head, keeping it with in regulation. 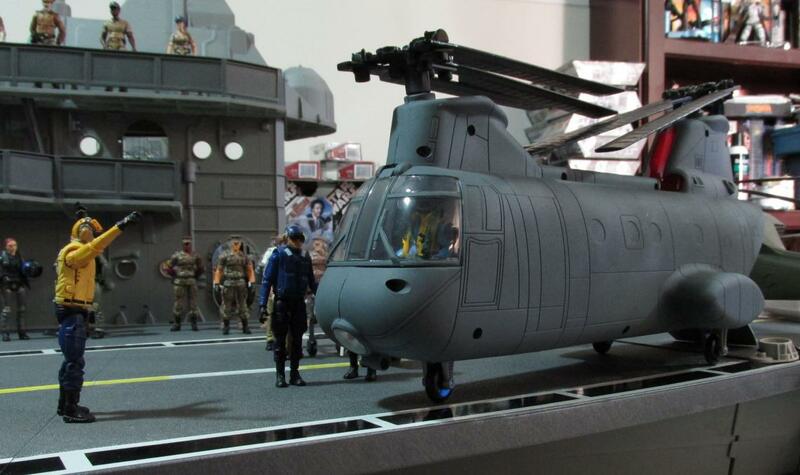 I have that same chopper, that looks amazing. Even with just the primer/aircraft grey, great job. So JMB, when are you going to put out a list or prices? Will there be a pre-order for boxed sets? Im so down for a few deck crews as well as some officers and marine detatchment. I have been completely amazed and inspired by the work that you have done, however you put these out, they will sell. So, what do you all think? 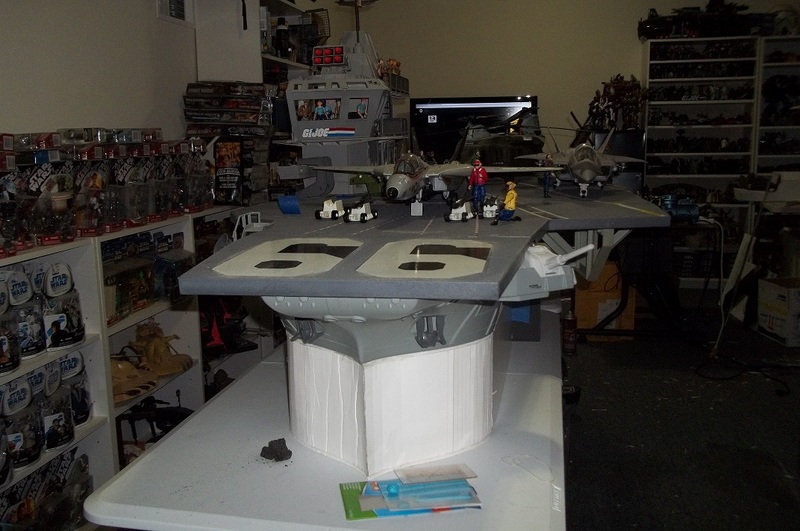 I did not have any plans to work from so I took a ballpark guess and made the second tier hull 6 inches. But looking at it now, I wonder if I made it too tall by an inch or two. I look forward to your inputs. WOW!! What an incredible project! 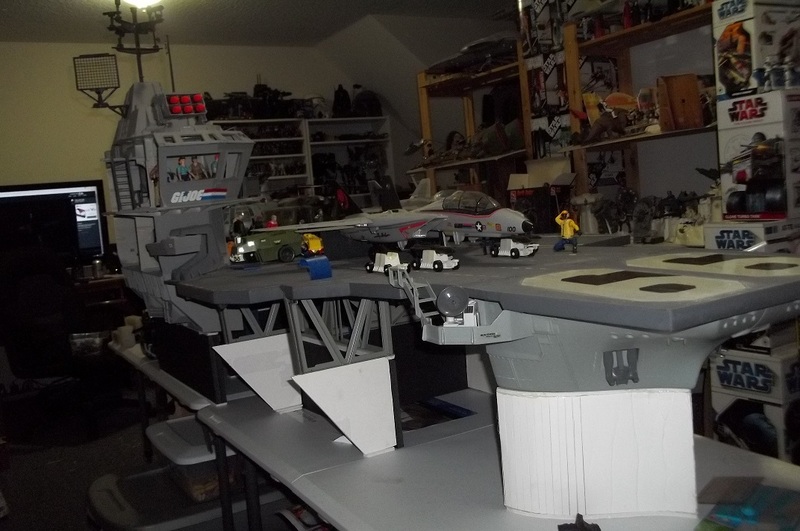 As a fellow USS Flagg owner that Flagg display table is definitely a source of inspiration. When I finally build a more permanent display I plan to do the same. But I think your figures are really the awesome part of this thread. So many great looking customs!! Plus I love how you are trying to follow actual air craft carrier guidelines/protocol. Looks amazing! Looks good, I'm v very jealous. The marine detachment is insane, did you build these guys? 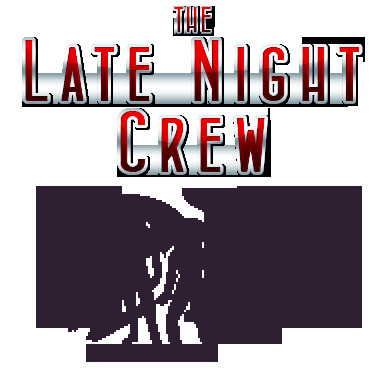 Can't wait to see more work on the crew! Any news or ETA on sales of the casts?